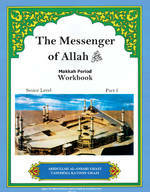 This workbook seeks to expand participants' self-awareness, spirituality, and religious identity through activities designed to enhance the material presented in the Messenger of Allah: Madinah Period textbook. Our workbooks are an integral part of IQRA's comprehensive program of Islamic education along with their accompanying textbooks. High school students have found the activities and exercises in this work book interesting and challenging.